By accessing and using this site in any manner, including but not limited to visiting or browsing the site, you (the “user” or “you”) agree to be bound by this agreement, including those additional terms and conditions and policies referenced herein and/or available by hyperlink. This agreement applies to all users of the site, including without limitation users who are buyers, sellers, customers, contributors of content, information and other materials or services on the site. Comicsy acts as a marketplace to allow its users, who comply with Comicsy’s policies set out in this agreement, to offer, sell, and buy certain goods within a fixed-price format. Comicsy is not directly involved any transactions between buyers and sellers. As a result, Comicsy has no control over the quality, safety, morality or legality of any aspect of the items listed, the truth or accuracy of the listings, the ability of sellers to deliver items or the ability of buyers to pay for items. Comicsy does not pre-screen users or the content or information provided by users. Comicsy cannot ensure that a buyer or seller will actually complete a transaction. Consequently, Comicsy does not transfer legal ownership of items from the seller to the buyer. Comicsy encourages you to communicate directly with potential transaction partners through the tools available on the site. For large value transactions, you may also wish to consider using a third-party escrow service or services that provide additional user verification. You agree that Comicsy is a venue and as such is not responsible or liable for any content, for example, data, text, information, usernames, graphics, images, photographs, profiles, audio, video, items, and links posted by you, other users, or outside parties on Comicsy. The Comicsy service is used at your own risk. Age: Comicsy’s services are available only to, and may only be used by, individuals who are 18 years and older who can form legally binding contracts under applicable law. You represent and warrant that you are at least 18 years old and that all registration information you submit is accurate and truthful. Comicsy may, in its sole discretion, refuse to offer access to or use of the site to any person or entity and change its eligibility criteria at any time. This provision is void where prohibited by law and the right to access the site is revoked in such jurisdictions. Individuals under the age of 18 must at all times use Comicsy’s services only under the supervision of a parent or legal guardian who is at least 18 years of age. In this all cases, the adult is the user and is responsible for any and all activities by either party. Password: Keep your password secure. You are fully responsible for all activity, liability and damage resulting from your failure to maintain password confidentiality. You agree to immediately notify Comicsy of any unauthorized use of your password or any breach of security. You also agree that Comicsy cannot and will not be liable for any loss or damage arising from your failure to keep your password secure. You agree not to provide your username and password information in combination to any other party other than Comicsy without Comicsy’s express written permission. Account Information: You must keep your account information up-to-date and accurate at all times, including a valid email address. To sell items on Comicsy you must provide and maintain valid payment information such as a valid PayPal account. Right to Refuse Service: Comicsy’s services are not available to temporarily or indefinitely suspended Comicsy members. Comicsy reserves the right, in Comicsy’s sole discretion, to cancel unconfirmed or inactive accounts. Comicsy reserves the right to refuse service to anyone, for any reason, at any time. 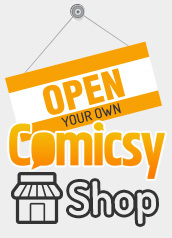 Joining and setting up a shop on Comicsy is free. Changes to the fees policy and the fees for Comicsy’s services are effective after Comicsy provides you with at least fourteen (14) days’ notice by posting the changes on the Site. However, Comicsy may choose to temporarily change the fees for Comicsy’s services for promotional events; such changes are effective when Comicsy posts the temporary promotional event on the Site. Comicsy may, at Comicsy’s sole discretion, change some or all of Comicsy’s services at any time. In the event Comicsy introduces a new service, the fees for that service are effective at the launch of the service. Listing Description: By listing an item on the Site you warrant that you and all aspects of the item comply with Comicsy’s published policies. You also warrant that you are entitled to legally sell the item. You must accurately describe your item and all terms of sale in your Comicsy shop. Your listings may only include text descriptions, graphics, pictures and other content relevant to the sale of that item. All items must be listed in an appropriate category with appropriate tags. Each listing must accurately and completely describe the item/items for sale in that listing. If the “in stock” quantity is more than one, all items in that listing must be identical. Digital Downloads: Comicsy accepts no responsibility for the quality, reliability, and security of downloads available through the site. It is the buyers responsibility to ensure they have the correct software to view the files. Shipping Policies: Sellers must create reasonable policies in good faith and must abide by such policies. Sellers are responsible for enforcing their own reasonable shop policies. Comicsy reserves the right to request that a seller modify a shop policy. Shipping Fees: The price stated in each item listing description must be an accurate representation of the sale. Sellers may charge reasonable shipping and handling fees to cover the costs for packaging and mailing the items. Sellers may not charge excessive shipping fees or otherwise avoid fees. You may not alter the item’s shipping price after a sale, misrepresent the item’s location, or use another user’s account without permission. You are solely responsible for your conduct and activities on and regarding to Comicsy and any and all data, text, information, usernames, graphics, images, photographs, profiles, audio, video, items, and links (together, “Content”) that you submit, post, and display on Comicsy. Re-Posting Content: By posting Content on Comicsy, it is possible for an outside website or a third party to re-post that Content. You agree to hold Comicsy harmless for any dispute concerning this use. If you choose to display your own Comicsy -hosted image on another website, the image must provide a link back to its listing page on Comicsy. Idea Submissions: Comicsy considers any unsolicited suggestions, ideas, proposals or other material submitted to it by users via the Site or otherwise (other than the Content and the tangible items sold on the Site by users) (collectively, the “Material”) to be non-confidential and non-proprietary, and Comicsy shall not be liable for the disclosure or use of such Material. If, at Comicsy ‘s request, any member sends Material to improve the site (for example through the Forums or to customer support), Comicsy will also consider that Material to be non-confidential and non-proprietary and Comicsy will not be liable for use or disclosure of the Material. Any communication by you to Comicsy is subject to this Agreement. You hereby grant and agree to grant Comicsy, under all of your rights in the Material, a worldwide, non-exclusive, perpetual, irrevocable, royalty-free, fully-paid, sublicensable and transferable right and license to incorporate, use, publish and exploit such Material for any purpose whatsoever, commercial or otherwise, including but not limited to incorporating it in the API, documentation, or any product or service, without compensation or accounting to you and without further recourse by you. Digital Downloads: Digital goods uploaded to the Comicsy website are made available to buyers to download up to 5 times. Comicsy can not be held responsible for buyers actions with the downloaded content. You agree to hold Comicsy harmless for any dispute concerning this use. Comicsy does not control the Content provided by users that is made available on Comicsy. You may find some Content to be offensive, harmful, inaccurate, or deceptive. There are also risks of dealing with underage persons or people acting under false pretense. Additionally, there may also be risks dealing with international trade and foreign nationals. By using Comicsy, you agree to accept such risks and that Comicsy (and Comicsy ‘s officers, directors, agents, subsidiaries, joint ventures and employees) is not responsible for any and all acts or omissions of users on Comicsy. Please use caution, common sense, and practice safe buying and selling when using Comicsy. Other Resources: Comicsy is not responsible for the availability of outside websites or resources linked to or referenced on the Site. Comicsy does not endorse and is not responsible or liable for any content, advertising, products, or other materials on or available from such websites or resources. You agree that Comicsy shall not be responsible or liable, directly or indirectly, for any damage or loss caused or alleged to be caused by or in connection with the use of or reliance on any such content, goods or services available on or through any such websites or resources. In the event a dispute arises between you and Comicsy, please contact Comicsy directly. Should you have a dispute with one or more users, or an outside party, you release Comicsy (and Comicsy ‘s officers, directors, agents, subsidiaries, joint ventures and employees) from any and all claims, demands and damages (actual and consequential) of every kind and nature, known and unknown, suspected and unsuspected, disclosed and undisclosed, arising out of or in any way connected with such disputes. Comicsy encourages users to report user-to-user disputes to your local law enforcement, postmaster general, or a certified mediation or arbitration entity, as applicable. Comicsy, for the benefit of users, may try to help users resolve disputes. Comicsy does so in Comicsy ‘s sole discretion, and Comicsy has no obligation to resolve disputes between users or between users and outside parties. To the extent that Comicsy attempts to resolve a dispute, Comicsy will do so in good faith based solely on Comicsy ‘s policies. Comicsy will not make judgments regarding legal issues or claims. COMICSY, and other Comicsy graphics, logos, designs, page headers, button icons, scripts, and service names are registered trademarks, trademarks or trade dress of Comicsy, Inc. in the U.S. and/or other countries. Comicsy ‘s trademarks and trade dress may not be used, including as part of trademarks and/or as part of domain names or email addresses, in connection with any product or service in any manner that is likely to cause confusion. COMICSY, COMICSY ‘S SUBSIDIARIES, OFFICERS, DIRECTORS, EMPLOYEES, AND COMICSY ‘S SUPPLIERS PROVIDE COMICSY ‘S WEB SITE AND SERVICES “AS IS” AND WITHOUT ANY WARRANTY OR CONDITION, EXPRESS, IMPLIED OR STATUTORY. COMICSY, COMICSY’S SUBSIDIARIES, OFFICERS, DIRECTORS, EMPLOYEES AND COMICSY’S SUPPLIERS SPECIFICALLY DISCLAIM ANY IMPLIED WARRANTIES OF TITLE, MERCHANTABILITY, PERFORMANCE, FITNESS FOR A PARTICULAR PURPOSE AND NON-INFRINGEMENT. IN ADDITION, NO ADVICE OR INFORMATION (ORAL OR WRITTEN) OBTAINED BY YOU FROM COMICSY SHALL CREATE ANY WARRANTY. SOME STATES DO NOT ALLOW THE DISCLAIMER OF IMPLIED WARRANTIES, SO THE FOREGOING DISCLAIMER MAY NOT APPLY TO YOU. THIS WARRANTY GIVES YOU SPECIFIC LEGAL RIGHTS AND YOU MAY ALSO HAVE OTHER LEGAL RIGHTS THAT VARY FROM STATE TO STATE. IN NO EVENT SHALL COMICSY, AND (AS APPLICABLE) COMICSY’S SUBSIDIARIES, OFFICERS, DIRECTORS, EMPLOYEES OR COMICSY’S SUPPLIERS BE LIABLE FOR ANY DAMAGES WHATSOEVER, WHETHER DIRECT, INDIRECT, GENERAL, SPECIAL, COMPENSATORY, CONSEQUENTIAL, AND/OR INCIDENTAL, ARISING OUT OF OR RELATING TO THE CONDUCT OF YOU OR ANYONE ELSE IN CONNECTION WITH THE USE OF THE SITE, COMICSY’S SERVICES, OR THIS AGREEMENT, INCLUDING WITHOUT LIMITATION, LOST PROFITS, BODILY INJURY, EMOTIONAL DISTRESS, OR ANY SPECIAL, INCIDENTAL OR CONSEQUENTIAL DAMAGES. YOU AGREE TO INDEMNIFY AND HOLD COMICSY AND (AS APPLICABLE) COMICSY’S PARENT, SUBSIDIARIES, AFFILIATES, OFFICERS, DIRECTORS, AGENTS, AND EMPLOYEES, HARMLESS FROM ANY CLAIM OR DEMAND, INCLUDING REASONABLE ATTORNEYS’ FEES, MADE BY ANY THIRD PARTY DUE TO OR ARISING OUT OF YOUR BREACH OF THIS AGREEMENT OR THE DOCUMENTS IT INCORPORATES BY REFERENCE, OR YOUR VIOLATION OF ANY LAW OR THE RIGHTS OF A THIRD PARTY. Comicsy does not guarantee continuous, uninterrupted access to the website, and operation of the Site may be interfered with by multiple factors outside of Comicsy’s control. We will endeavour to maintain a 99% service level up-time for the website. You shall comply with all applicable domestic and international laws, statutes, ordinances and regulations regarding your use of the Site and any Comicsy service and, if applicable, your listing, purchase, solicitation of offers to purchase, and sale of items. In addition, you shall be responsible for paying any and all taxes applicable to any purchases or sales of items you make on the Site (excluding any taxes on Comicsy’s net income). You and Comicsy are independent contractors, and no agency, partnership, joint venture, employee-employer or franchiser-franchisee relationship is intended or created by this Agreement. Sections 3 (Fees and Services, Fees and Termination), 6 (Content, License), 7 (Information Control), 8 (Resolution of Dispute and Release), 9 (Comicsy ‘s Intellectual Property), 10 (Access and Interference), 11 (Breach), 12 (Privacy), 13 (No Warranty), 14 (Liability Limit), 15 (Indemnity), 16 (No Guaranty), 18 (Severability), 19 (No Agency), shall survive any termination or expiration of this Agreement. Added to site 9th September 2012.